If you already have a Fireball, just turn up, pay your club fees and start sailing it. See our special offer on joining fees if you need convincing. If you are an experienced sailor from another fleet or a complete beginner, you may wish to take advantage of our 'stop me and try one' scheme (run throughout the summer). 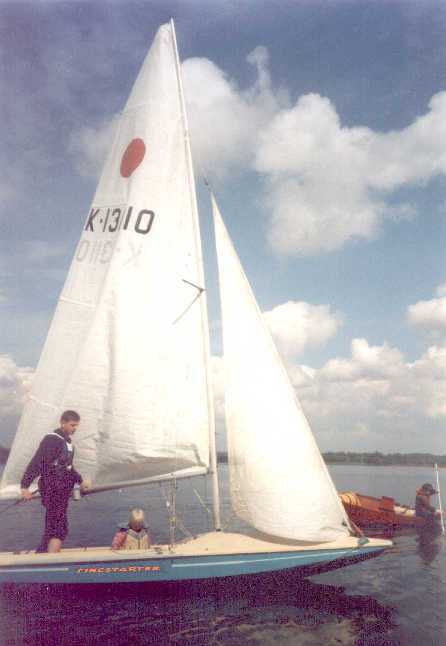 The basic premise is that we organise for an experienced sailor to take you out for a jolly round the lake, endeavouring to keep the boat upright throughout. Whether you opt to helm the boat or crew it is up to you, and depends on whether you plan to buy your own boat, or simply crew in somebody else's. Most newcomers to the fleet would like to crew a boat for a time to gain experience, but often find that they are unable to find anyone to crew for as most boat owners already have a permanent arrangement with their crew. Experienced crews are always in demand, but you can't get experience if you can't find anyone who will take you out. The best way to avoid this Catch-22 situation is to get in touch with the fleet captain. When the time comes to buy a boat, your friendly fleet captain will also be pleased to help you to choose a decent example either from the club or elsewhere. There are some fantastic deals to be had on some boats, particularly in the winter. See the page on buying a boat for more details. You don't need to be desperately young, strong or fit to sail a Fireball, although the crew needs to be moderately mobile. Draycote helms range from early twenties to late fifties in age and (I'm being tactful here), from 9 to 14 stone in weight. Crews are similarly aged, and range from 8.5 stone to over 14. If you are heavier or older than this, then you could sail a Fireball, but would probably do better in a Flying Fifteen.